Just My Dinner: Freeform Plum Tart! 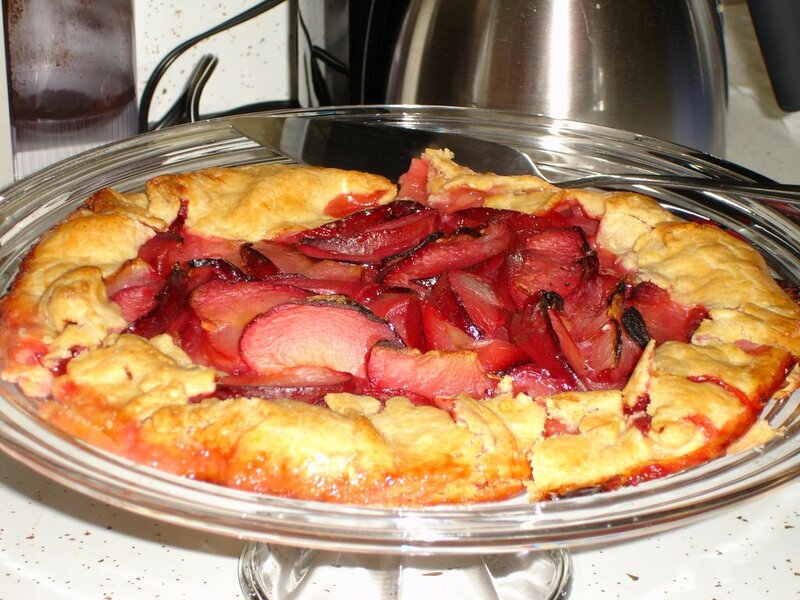 Ever since I got home and saw my July/August issue of Everyday Food, I've had my eye on the Rustic Plum Tart. Yesterday I was debating back and forth between making it or Bizcocho de Naranja. Since I had everything for the plum tart except the plums, I decided if I could find some good plums, I'd make the tart. And I did. I just had to make some minor adjustments. I took pictures. I just packed my camera before I copied the pictures onto my computer. In a food processor, pulse flour, cornmeal, sugar, and salt to combine. Add butter and pulse until it resembles a coarse meal. Add 2 tablespoons ice water and oulse until dough is crumbly, but holds together when squeezed. Turn dough onto floured work surface. Knead once or twice. Flatten into a disk, wrap in plastic wrap, and refrigerate at least an hour. Line a rimmed baking sheet with foil. Flour a large piece of parchment (about the size of the baking sheet). Place dough on paper. Lightly flour dough and roll out into a 14-inch round. Put parchment paper with dough on the baking sheet. In a large bowl, toss together ingredients for the filling. Pour into the center of the crust, leaving a two-inch border. Fold border over fruit and brush with egg wash.
Bake tart until crust is brown and filling is bubbling, about 35-40 minutes. Tranfer baking sheet to rack. Let cool 20 minutes. Serve warm. Wow. Was it good? I just made my first tart yesterday. It turned out delicious. I think it's something I'll have to make again. I just have so many other things I want to try. But mine was lacking the cream yours had.